Today’s microelectronic devices come with one major limitation: a rigid three-dimensional “box” with which the human user must interact. What if devices were free from the confines of this box? What if we could build high-performance, flexible electronics platforms that are thin, lightweight, rugged and conformable to any surface? 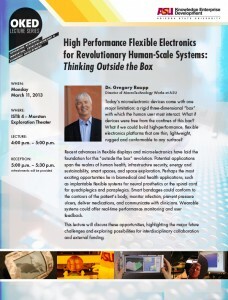 Recent advances in flexible displays and microelectronics have laid the foundation for this “outside the box” revolution. Potential applications span the realms of human health, infrastructure security, energy and sustainability, smart spaces, and space exploration. 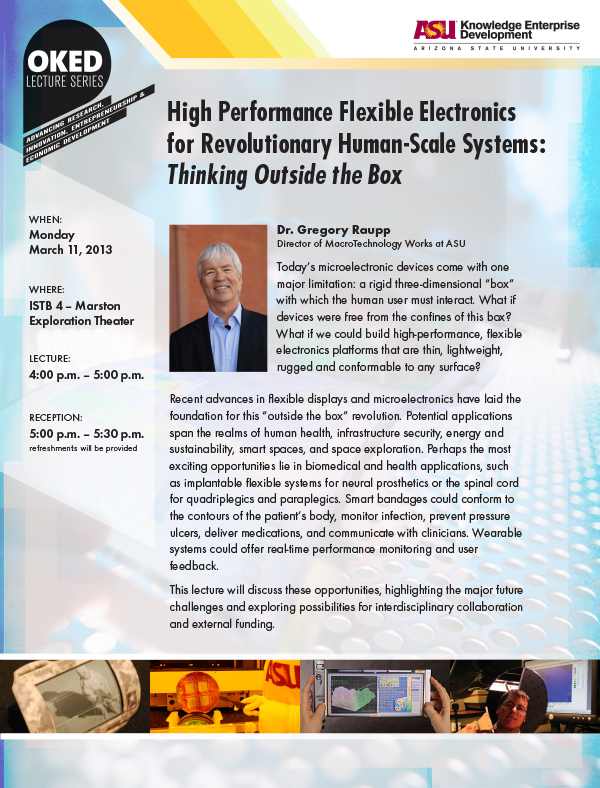 Perhaps the most exciting opportunities lie in biomedical and health applications, such as implantable flexible systems for neural prosthetics or the spinal cord for quadriplegics and paraplegics. Smart bandages could conform to the contours of the patient’s body, monitor infection, prevent pressure ulcers, deliver medications, and communicate with clinicians. Wearable systems could offer real-time performance monitoring and user feedback. This lecture will discuss these opportunities, highlighting the major future challenges and exploring possibilities for interdisciplinary collaboration and external funding.